Funeral services for David Sjodahl King Jr. 23, 2474 Alden St., will be Tuesday at 2p.m. in Parley’s Seventh LDS Ward Chapel, 2615 Stringham Ave. (2285 South). Friends may call Monday, 6-8 p.m., Sunset Lawn Mortuary, 2350 E. 13th South, Tuesday one hour prior to services at church. Burial Salt Lake City Cemetery. Died September 6 in a one-car accident near Syracuse, Kansas. Born June 28, 1945, Salt Lake City to David Sjodahl and Francine Evans King. Served a French mission for the Church of Jesus Christ of Latter-day Saints. Member Utah National Guard. Survivors: father, David S. King Sr., serving in Malagasy Republic (Madagascar): stepmother, Rosalie Lehner; mother; brothers, sisters, Mrs. Robert (Jody) Olson, New York; Frank, Stephen, Matt, Christine, Christopher, all Malagasy. I am Bill Cordray from Salt Lake City. I was a classmate of your younger brother David Sjodahl King from Olympus High School in 1963, in fact, all the way back to Canyon Rim Elementary School. My memorial committee has been looking for photographs and obituaries of our deceased classmates. Our 50th Reunion is this coming August 11. This is a short notice but it has taken me several years to figure out how to find information on your brother beyond his obituary after his death on September 6, 1968. When I saw JoLee Black Heaton again a few days ago, it occurred that she might have some photographs of David if he were attending some event for your father or the Democratic Party. The only photo I have is from David's sixth grade class at Canyon Rim but it's a grainy group shot and David is looking at the ground. I do remember how shy he was. 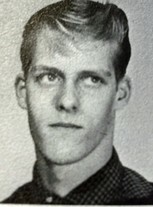 If you have any old photos of David, would you be willing to share one our two with his old classmates? Or could you direct us to some other source? If you could have a couple of photos from age 15 to 23, would you be able to find someone to scan those and send me a jpeg file? If you are able to find something before Saturday, that would be fantastic. If not, as I expect it to be too short of a notice, please send one or two whenever you might find them so we can eventually update our class web site. 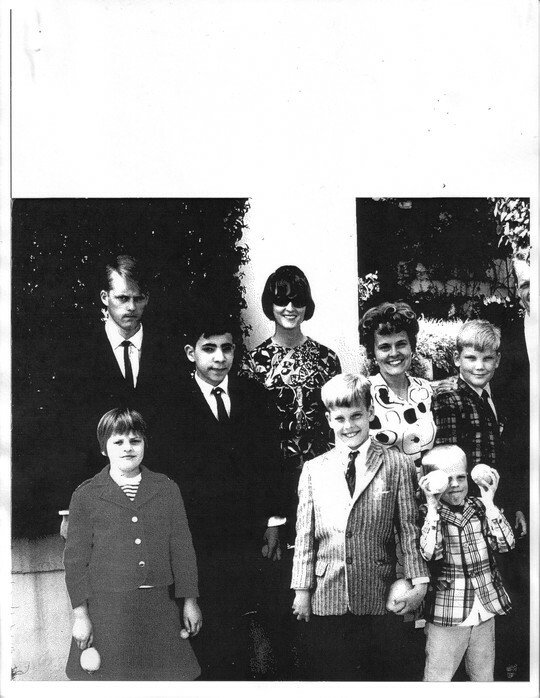 I have one photo, a family picture taken in Tunisia, 1967, that includes David. I will try to scan it tonight and get it to you. Thanks so much for thinking of him as part of the 50th anniversary. Even after all these years, his loss is still felt deeply in the family. This didn't come out very well. I will try another way tonight. But, just in case, it is something. Just an update on the people you see in the photo. The photo was taken, I believe, in January of 1968. David had just finished his Mission in France and was visiting my husband and me in Tunisia where we were Peace Corps Volunteers. My parents were coming through Tunisia on their way to Madagascar where my father was to be Ambassador. David joined them in Tunisia and then went with them to Madagascar. He died shortly after he returned to SLC after about six months in Madagascar. This photo was taken at the Ambassador's House in Tunis. Far left is David (whom I still miss desperately), below him, sister Christine (now living with family in Orem, UT), next is brother Franklin, whom we have sort of lost track of, then me the happy Peace Corps Volunteer (most of my life has been Peace Corps, and you see below what I do now), below me is brother Matt (now in Orem with family), lower still is brother Christopher (now living in Gaithersburg with family), next to me is mother Rosalie, now in assisted care in Orem, then brother Stephen (business man in Fredericksburg, VA), and finally my father who died four years ago after a great life of law, US Congress, Ambassador, World Bank, Washington DC Temple President, Haiti Mission President. Thank you so much. Even a dark photo without a smiling David is much better than no photo at all. If you can improve on it that would be good. I can still get him into our Memorial program power point slide show as late as tomorrow afternoon. Would you mind if we posted your comments and the full family photo? That was very touching. Otherwise, we only have a bare obituary with the old clipped style. I would be delighted if you gave the family story. One more note, he died just as I returned from Peace Corps and found out I was pregnant. I named my son after him and today, at 44, he proudly carries the name. It was my parting gift to my brother. Dave and I grew up in the same little neighborhood and attended the same L.D.S. Ward, so Dave was in the Boy Scouts and everything else that went with that, along with Paul Bjornn, Bill Barrett, and others. I was at David's house, quite often, when we were young. I always found him interesting, kind, and smart. David went on his Church Mission in Paris. I did mine in the Southern half of France and Francophone Switzerland, but upon coming home, Dave, Carla Cannon, and I were in several very interesting and thought provoking French Literature classes at the U. These were all conducted in French and everything read or written, of course, was in French. I recall reading and discussing Stendhal, Proust, Balzac, Alphonse Daudet, Guy de Moupassant, Emile Zola, Albert Camus and many other great writers and how living in France impacts your soul and life, both in class and with David, independently. Our common French experience made Dave and I even closer friends. When David was killed returning to some of this very sort of classes, it hurt deeply. As I recall, and my memory might be faulty here, is that Dave was driving straight through from D.C. and must have fallen asleep at the wheel. I think he crashed into a bridge abutment. I think maybe that his father told me that, later, when I met with him when we lived in D.C. I became even closer to Dave, somehow, when my family and I were able to live in Paris for a couple of years as I wrote my doctoral dissertation for Columbia, under the tutelage of the best criminal law scholar and the best international law scholar at La Sorbonne (Le Pantheon - Paris I). Our daughters went to their first 2 years of school in Paris - French schools, so some of Dave's soul had to have seeped into them, as well. I paid homage to Dave often, at the Pantheon Museum and at the book kiosks along the Seine. If you have lived in Paris, you know that it becomes part of you and you become part of it. Dave was there. Since that time, I have taught and lived in Paris many times and I never don't think of Dave and sense his soul. Click here to see David S.'s last Profile entry.